Martin Booth was a poet and writer of mostly non-fantasy fiction. He died of brain cancer in 2004 before finishing The Alchemist’s Son trilogy. Martin Booth’s obituary. The Alchemist’s Son — (2003-2004) Ages 9-12. Publisher: When Tim and Pip’s family moves to an old English country estate, they accidentally awaken an alchemist’s son, Sebastian, from a centuries-old slumber. But Sebastian’s father’s enemy, Pierre de Loudeac, has also awakened — and is relentlessly pursuing the dream of alchemists to create an homunculus, an artificial human made from dead material. Aided by Sebastian’s wise guidance and insight into six hundred years’ history, the two spirited siblings bravely take action to stop the man’s ominous quest. But even as they daringly defeat de Loudeac in this battle, Evil lives on… All the magic in Dr. Illuminatus is real, the author has noted, the chants, the herbs, the potions, and the equipment. The irresistible combination of history, humor, and horror will keep young readers on the edge of their seats — and anxious for the next installment. 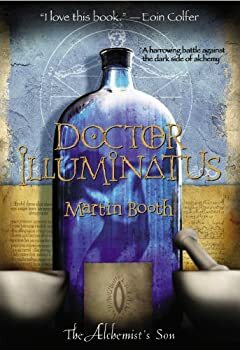 Doctor Illuminatus is the first of what promises to be three books, and it deserves two and a half stars, putting it exactly midpoint between good and just fair. Though it has an interesting premise and is full of fascinating facts and ideas, it often falls short on several accounts. I have tracked down Soul Stealer, but I must confess that my search for the third book in this series will be even more lethargic than the search for this one. 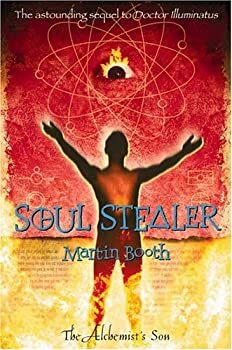 Despite a strong beginning, and excellent use of real history and alchemical knowledge in the shaping of his story, Martin Booth continually fumbles in his melding of ancient and contemporary times.